Lockside is an ideal venue for birthday parties, civil partnerships, weddings, corporate events or just an excuse to get together. 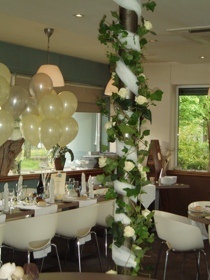 We can cater for any special occasion at Lockside for up to 75 people. Tailored around you, your celebrations will be with your party exclusively and will be exactly as you want them to be. For further enquiries we request that you do not phone the restaurant direct, please call Gary on 07805 269 076 and he will be happy to discuss your personal requirements with you. Or please click on the links opposite to find out more about what Lockside has to offer.